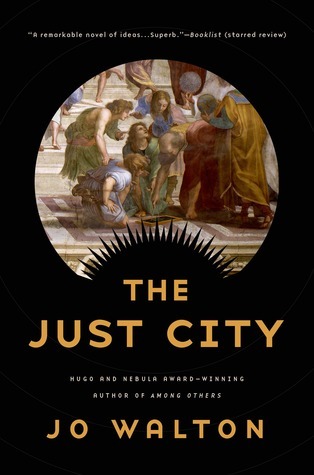 I’m reading Jo Walton’s The Just City. Maybe it’s just me, but even though this book came out four months ago, I’ve heard zero buzz about it. I don’t know why. There’s something really fun and ridiculous about it. This is a book about Pallas Athena (yes, the Greek goddess) transporting 300 philosophers from throughout history to an island at the beginning of recorded history so they can create an ideal society, as set forth by Plato’s Republic. If you’ve ever read The Republic, you’ll immediately understand how absurd this is. For one thing, The Republic is an authoritarian nightmare. There is literally no personal freedom. However, since this book begins w/ people who’re all of the same mind, it takes awhile to unravel. I just can’t. The book is so weird. I love Jo Walton. The only book of hers I haven’t been able to get into was Among Other, but her Small Change trilogy and her last book My Real Children are amongst my favorite books of hers. Jo Walton gets plenty of buzz and sells plenty of copies, I’m sure, but I feel like she should get even MORE credit. When her books release, it ought to be a bigger event than when Neil Gaiman’s books drop. I mean seriously, her books are so smart and so readable. I wish someday I’m half as good (and half as accessible) as she is. There was a quote from me in a New York Times article! I hadn’t heard of it before now.